I tried yesterday to My FD. The same symptoms were observed even if the pump was replaced. The stepping motor does not work well. That's it, I switched it back to the old firmware. I will report it just in case. What firmware was in your ECU prior to the change? There have been no known changes to rotary oil pump control for many releases but it is possible if you were on something older than 5.6.5 you might have got hit by the corruption thing that Simon mentions above. Try again once we release the fixed version (hopefully in a few days). I used before 5.6.6 and now is 5.6.5.3338 firmware. It is in 5.6.6. As per Simons post above we have pulled it off the website temporarily as we have found a problem when connecting to old firmwares. I expect it will be fixed and re-released in the next few days. Is there any word on when the update will be re-released? My tuner updated my ecu's firmware when it was on the dyno 2 weeks ago and I haven't been able to connect to it since because I don't have 5.6.6 on my laptop. Should being the key element in that. We have put in a couple of other fixes so taking a little longer. But it is very close I have been running a test version for a few days now and all seems happy. Does the update also contain the fix for the DBW throttle idle? 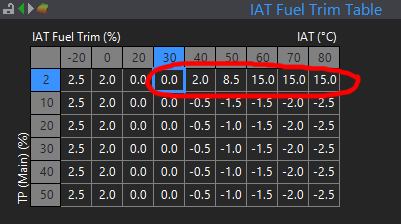 FYI, in future release, could you please update the basemaps for nissan 350z IAT fuel trim table. Sorry if I posted in wrong thread. Im pretty sure that map was done by High Performance Academy, I assume since it is a NA car and wouldnt normally have running intake temps above about 30°C, the enrichment at high intake temps is done intentionally to compensate for hot start heat soak. Thanks for the feedback. I guess this should be part of another thread. Any news on release date? Need this update ASAP any news on how long ?????????? I assure you all we will let you know once we have it out. Would rather have it all well sorted so we don't make the same mistake again. Yep thats been done in 5.6.6. The manuals on the respective ECU page on our website should always have the most up to date pinouts. The base map that we send out in the ECU should be set up correct as far as I know, are you saying its not? The ECUs are being shipped out with the correct map already loaded in them. The 5.6.5 basemap is set up wrong as that was from before the hardware change. Yes all the basemaps have all been updated in 5.6.6 to cover hardware changes, firmware changes and a few mistakes that have been reported. When come your new final Update? Have your update a better PID Boost controller?